A contributor on my website called my attention to the fact that some readers "hear what they want to hear" when they read my articles. I do tend to be verbose sometimes when I get going, so maybe some of the key concepts are getting lost in the shuffle. As a result, I'm going to try to keep this article as succinct as possible... right after this detailed discussion regarding the reproductive cycle of the Western honeybee. Sorry! Just a little off-beat humor there, designed to lighten the mood and elicit outrage from entomologists. To keep it really simple: I have not capitulated the entire bear case. I'm not going to be on CNBC next week talking about how stocks are "undervalued" and how the market always goes up in the long run. Those statements will be reserved for my appearances on talk radio. Of course I'm kidding again! See how fun this column is? Seriously, here's the simplest way to understand it: I am short-term bullish and intermediate-term neutral. As I attempted to outline yesterday, the shape of the next decline should help answer many of my questions as to whether that decline will turn out to be a buying opportunity or not -- hence my present neutral stance. The point I was trying to drive home, and have been trying to drive home for some time is "the trend is your friend." And until proven otherwise, the trend is still up. This isn't an opinion or a projection: it's simply a fact. Hopefully that clears it up. The market is still facing a fairly critical test at the 1350-1360 overhead resistance level. So far, it's been unable to break through. If it can't and 1321 is violated first, then all short-term bullish bets are off. Yesterday I showed a more bullish big picture count, but at the same time, I tried my best to explain that the market still has myriad options. Once the price action takes some options off the table, the big picture counts will come into better focus. When we get to that chart, I'll try to better clarify what I believe the two main options currently are. These two options are by no means the only options, though, and more info is simply needed from the market at this stage. The first chart I'd like to share is missing a lot of data, since I'm only going to share the price portion of the chart. This chart represents a conglomeration of several of my proprietary signal indicators; it took years to develop, and it's simply too darn good to put out on the internet for free. It's exceptionally reliable at picking bottoms (only 2 buy signals all decade: March '09 and October '02), and it's reasonably good at picking tops as well, though it tends to be a little early. I could tell you what all the different signal indicators consist of, but then I'd have to kill you. And I simply don't have that kind of time. Yesterday, these combined indicators fired off the first topping signal in a year. The chart below shows the S&P 500 (SPX). The vertical red signal lines indicate top signal trigger points, the green lines indicate bottom signals. One can see how exceptionally accurate this indicator has been over the years. While it doesn't necessarily mean the market is going to top tomorrow (though it can), it does indicate that, at best, over the next 6 months the upside should be limited. This indicator is a big red flag to those Elliotticians expecting an immediate massive new bull market (of which I have never been one). This top indicator can trigger during bull markets, but even in 2004 and 2010, it indicated a large correction was forthcoming before further advances. In 2007 and 2011, it was early, but did indicate that a major topping process had begun. In all prior cases, the market made new lows within 2-3 months of the signal trigger. So theoretically (assuming this indicator is still working, of which there is no guarantee) one could sell short tomorrow and cover in 2-3 months for a profit. This is a powerful signal, and I believe it suggests extreme caution for folks considering a long term buy and hold approach at this juncture. It would seem that, even in the event that a new bull has started, there may be a better entry point further down the road. The next chart is the intermediate count for the SPX, and I have tried to add more clarity to the chart. Neither I, nor anyone else, can predict for certain whether the next peak will mark all of wave (c) or only wave (iii) of (c). At this moment, I am slightly favoring the view that it will mark (iii) of (c), with a correction to come, and another leg up still to come. This view is largely based on the pending liquidity flood from the European Central Bank, which is due to be unleashed into the world on February 29. If the coming peak marks wave (iii), then that would allow for a correction heading into the ECB date, and then another thrust upwards when the liquidity hits. The old saying regarding central banks is, "don't fight the Fed." This saying was immortalized for bears in the 1959 Crickets song, "I fought the Fed and the... Fed won." The same saying can also apply to the ECB, even though they don't have their own song yet. The way things are going over there, they probably won't be in existence long enough to warrant a song. Anyway, a trip below the red wave (i) peak would rule out further upside for that count. I do expect a significant decline when wave (c) completes. The next chart is the short-term SPX count, which suggests that the rally is still underway, with new highs in store. There are reasonably good odds now that the coming peak will at least lead to a trade-able correction, if not the start of something more bearish. I find the market's behavior around the upsloping red trend line fascinating. I first called attention to that line over a week ago, and you can see that the market has continued to behave as if it's an important line. Can't tell ya' why, but it is what it is. The last chart is the short-term count for the Dow Jones Industrial Average (INDU). It's slightly different than SPX, but similar. 1) The market is still below an important resistance level. Going long before it's broken would be front-running, and the equivalent of going short back in December near 1200. If that resistance level is broken, then the 2011 highs mark the next key resistance. 2) The trend is your friend. Once we see an hourly bar print beneath the short-term trend channel, and then some daily closes outside of the larger trend channels, we can have confidence in a meaningful trend change. Until then, the trend is still up. 3) I trust my work. The fact that my proprietary indicator just fired off the first top signal in a year gives me high confidence that there will be no monstrous new bull market starting from these levels. This doesn't rule out further upside over the near term, even into the 1400's, but this indicator hasn't failed yet. Near term, the bulls could still run with the ball, but this indicator very strongly suggests that the bulls will run into trouble reasonably soon. However, see point #2. 4) I expect a significant decline when wave (c) completes. However, see point #2. 5) Cash is a position too. Good post PL. . . I liked the way it just dropped right off the 1349 ES area on the 15 minute. That kind of exaggerated movement shows some interesting volatility. 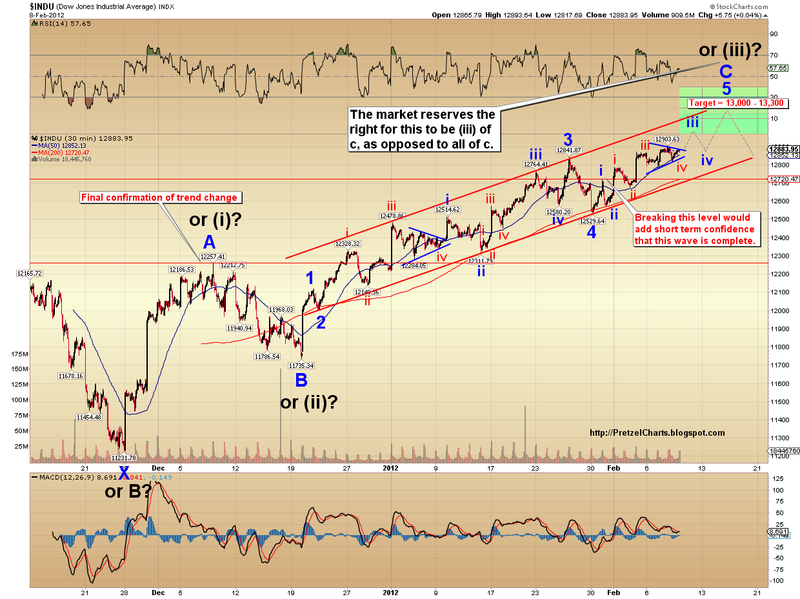 It looks to me like this is part of a 4th wave, so a lower open would fit that view -- see the ST SPX chart. Quick question: In chart 3, What does the annotation "First confidence of trend change" mean? Second quick question: In chart 1, The Feb 2004 red signal is worrisome. That was in the middle of the housing bubble, and Leman Bros. hadn't yet filed Chapter 11. OK, that was different. Still worrisome though. What's my question? Not sure. Maybe this: Is it possible to have a bit of a correction or three, over the next few months, and then a relentless rally from there? This question sounds so insane, but this seems like an insane world, sort of. 1) It means that will be the first warning to bulls. Doesn't guarantee a trend change, but adds significantly to the probability. 2) Sure, it's possible. By then, we will hopefully have enough info from the market to determine whether it's at all likely, though. Nice post PL. That short-term SPX count is nice (chart 3). I might be able to use wave retraces for entries and stops. Thanks! Wondering about timeframe. I were to target March 1 for completion of wave (c), because of Furrr's Jupiter, would that better fit a 1370-ish top, or a higher top as marked in chart 2? So remember back to 2004, was it getting clear soon enough, in April for example, that the correction was going to be a lateral affair? My preferred target if we see the correction and another rally leg would currently be 1440ish... but I would need to see where the presumed wave 4 bottoms to get a truly accurate target. The double-Fib area should indicate that zone will offer resistance, and gives it a slight edge as the next target. Doesn't really give it an edge to be a long-term top, though. Thanks for straightening me out on the double Fib. Very nice article PL. You really have a knack at writing...really good stuff. The conclusions were great. And now that the bulls and the MSM are snorting en masse, your observations make even more sense. Thanks again for another great piece....I especially like conclusions 1) and 5). I am now quite comfortable leaving the house....You should be receiving glad tidings in a week or so. They're probably shipping out today. So I take it you're playing it smart: in cash? What's MSM, by the way? Sorry, was afk. Umm... mainly PB. Maybe a box of Krimpets and coffee kakes. The coffee cakes are the ones with the little cinammon pellets on them, right? It's been so long, I can't remember whether I liked them a lot or just liked them. Here is what I am seeing for the next few days. Slowly building towards a change in direction. btw, do you like chocolate covered macadamia nuts? PL, I really dig your sense of humor: Buddy Holly? Earnest Borgnine? Where else can one have this much fun in a technical analysis blog?! I also take your "humor index" as an indicator that your confidence is peaking. Keep up the good work. Good morning PL, great post as usual. Wow, quick move just now. Glad I was long the ES. I'm out for now with a good showing for the day. ECB's Mario Draghi (google him and be amazed of his ties to GS and hiding Greek debt through swaps) has a press conference at 8:30 EST (in about 4 minutes). He may give clues to the next batch of LTRO. It's all cured, 'cause they have such a good track record of doing what they say. It would also appear that the ECB is announcing that they are willing to take lower quality collateral assets from the European Banks in exchange for loans. So now they can finally bring all those recyclable beer and soada cans stack in bags in the corner left over from the New Years Party and cash them in at the ECB... cool! lol -- Yeah, Greece is pretty slippery. Even lower quality than they're taking now? Amazing. lmao What? Aluminum is a precious metal? Gimme an ETF symbol, quick! It will be fun deleveraging those later! At least the beer cans would have a real value in the open market in a few years- as opposed to the soveriegn debt they now hold! Out at 1349.75. No patience for that trade and too tired to watch. Yeah, well, I didn't get anything on the "Bot! Twelve o' clock!" joke yesterday, which I thought was absolutely hilarious. But then, I ate a lot of paint chips as a child. it's all a three card monte game...run by the same guys who have been running it for a long time...it'd be funny if it weren't true. Watch it! Bots at 6 o'clock, at 10 o'clock, at 1 o'clock!! Another one at 8 o'clock. Dive, damn you, dive!! I was too early, am long from 48.50, going to wait for the cash open and see what happens there, hopefully get a pop right before then. BTW, great post. AAPL is on fire premarket and has been on fire for some time. IMHO the trend holds till the debt is actually PAID. I think that by now every level of investor does't believe that the Greeks will do what they say, but many are hopeful that the Troika has some power to hold their feet to the fire. I don't, but I do have the time to not take my eyes off my trade while this trend lasts. There has been no agreement. There were just a bunch of stories that said a deal was near which is the same as has been going on for the last two years. Here is one that explains nothing has been solved. Now that the Greek can has been kicked, its now time to begin fretting over Portugal. No deal has yet been reached. They still have to sign. Things are getting close and will most likely succeed. What happens when Portugal needs additional help. 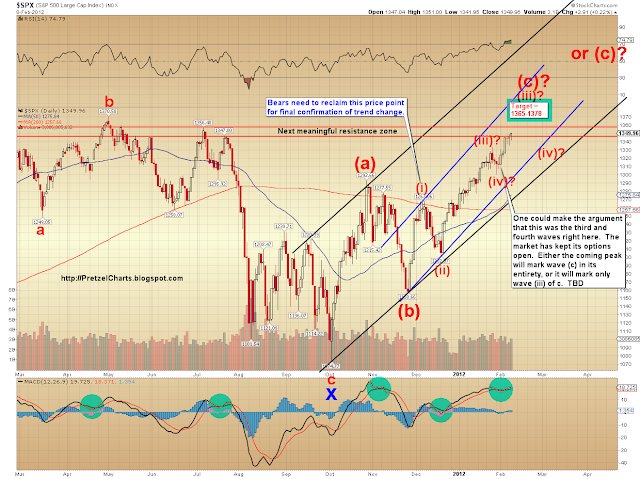 The fact that the Dow took out the 2011 highs makes it very high probability that SPX will too. If you compare the two charts over the long term, the Dow almost always leads, and when it makes a new high, SPX almost invariably follows. Who know, though. INDU diverging from the Trannies right now. And as I've been saying, this level should be solid resistance -- so maybe they finally ran out of steam as they reached it. If the fourth wave is playing out, it would look best with another drop to around 1335-1341 before rallying again. The expiration dates are good, but of course they are for decorative purposes only and can be ignored. I also threw in a roll of TP so you can TP your avocado tree for me in absentia. I'm really a "flaming bag of poo" guy but that wouldn't have worked out according to the USPS regs....stupid rules. In the event that you cannot finish them all (or die trying to), please remember to keep them away from the W.S. across the street. If they find out what you have, they are likely to form a mob, collect you, and burn you and the deliciously unnatural cakes at the stake for heresy and/or environmental crimes. It may take aapl hitting 500 to signal frothiness to the market. "Holger Schmieding" -- what an unfortunate name. I'm not sure if I gave a golf clap or not on that one....I was runnin' off at the keyboard...AR got me going...I think both he and I were vaccinated with phonograph needles. Wouldn't ya just love to pull the plug on them for a day to see what would happen...just to see. Awesome! I'll be checking the mail everyday 'til they get here. 9000 calories, yum! I know you didn't ask for nothin', but I'll send ya some local Hawaiian treats. If I recall, you mentioned kona coffee... any particular blend you like? Vanilla, chocolate, etc.? Or just regular coffee? Or decaf? I don't get the electrician part? this is the ticket out for Greece. Greece: How much can I get for this slightly used temple? ECB: Do you want to sell it, or loan it. Greece: Just loan it...unless the price is right. ECB: Well I do have this German customer who was lookin for something like that. They're used to getting stuff for nuthin' tho'...Let me make a call. 'an agreement has been reached' that is necessary before said agreement can be signed. Yesterday, Greek pols had not reached agreement. this is news, and the reaction to the news is what's most important, as many others have said. So far anyway, uptrend has not been broken. My target is 650 ST.
Obviously wrong about AAPL... everyone still piling in. His parents are mean people. But here's one for ya...a kid with the first name of shitheed, but actually spelled how you think it would be...or "Le-a" (correct pronunciation "Ledasha"...Only in Berks County. Bond market is tanking, a bullish sign. Because some of the cash will go to equity. Or they were, right up until I said something. They're like, "We are? Oh whoops, our bad!" 500 and beyond, in due time, but grossly overbought in the short term. Just regular caffeinie goodness is wonderful...ah the aroma. Thank You. Don't forget money is cheap. You're a good guy. Stay that way. Anyone else think the Greeks will have a John Kerry moment (I voted for it before I voted against it) on March 21st? Well, as exciting as this market is right now, I need to get a few zzz's. just gap filling. watch for strong rally coming up soon. Sold my SPX shorts from yesterday. Opened yesterday at 1349.75 and sold today at 1345 for a few points. It was getting lonely. They'll have a Reagan moment..."I don't recall"
I think they're running out of water, or afraid everyone will drown if they turn on the spigots. APPL is the stand in for gold. :) It's a third the price and ten times more liquid. OK, suppose the U.S. had to cut all pensions, SS, minimum wage, and jobs by 20% to pay back a debt to, say, Argentina. Think we'd all go for it? The Greeks have to vote on this on Sunday. Let's see if the Hellenics roll over and play wasted. this should bust through 1350 convincingly. No! I wouldn't think of that... I am just saying that when it turns, a major driver of the rally will become a major headwind. AAPL is actually looking like it might hit 500 today... amazing. APPL analysts are beginning to pile on. The new upper range is now 665. More will follow. Trying frantically to cover today and the next few days, ahead of analysts' upgrades. It will go side way for a bit before marching northwards again. Added shorts again at 1349 with a stop at todays high. If that morning gap gets filled, I am out. I agree. This move is impressive. Sure looks like 500 soon. But when it turns this could lead the way down imo. Billa will soon be posting as "The Riddler" lol. and in the following months where you were expecting another downturn you gave us more than adequate stops to use in the event the market went up and in each case you accurately predicted the target that it would hit. I first noticed one of your posts I think in early August on the yahoo finance page, became curious and went back I think as far as April and read some of your archived posts; Minnyanville only keeps around four months of your posts so that was as far back as I could go. I do print them out and save them. I'm satisfied with what I found and your analysis. If I thought you were a joker or a fraud I wouldn't waste my time reading your posts. Perhaps you should charge say $50 a month for immediate access to the daily update and the right to post comments on this blog. Looks like you were correct on the RUT direction. That top TL is now acting like resistance so far. 833 may have been ???. I can say the word, lol. Have to see where today finishes but the tl is holding so far imo. Looks like another test of Friday's high is coming up. The streets of the US would be filled with broken glass under the same circumstances. AAPL has 20% of the smartphone market, but 80% of its profit. It is Felix Zulauf’s position that the S&P will likely fall 20% in first quarter unless it reaches 1370 first. So he expects it to go down unless it goes up? Sounds reasonable. It's a good opportunity to get out with this pullback... or even change direction. An agressive buy program at 11:49AM killed that down move in an instant. The day is not over of course, so plenty of time for me to be wrong still, but I'm calling 1353.53 the top.... for this week at least. Out with a small loss. Broke even for the day. Going to wait to find the trend and make it my friend. Suffering death by a thousand cuts without my friend. LOL - The Irish persuader thing went right past me. What I'm saying is that tomorrow would be the 8th close up for the S&P. The red daily candle is overdue. The expensive brandy is on me. unbelievable wicks on the 120 & 15 ES. Candle wick high of 1352.75 and low of 41 ES on the 120 establish dailyr range, first break determines direction. 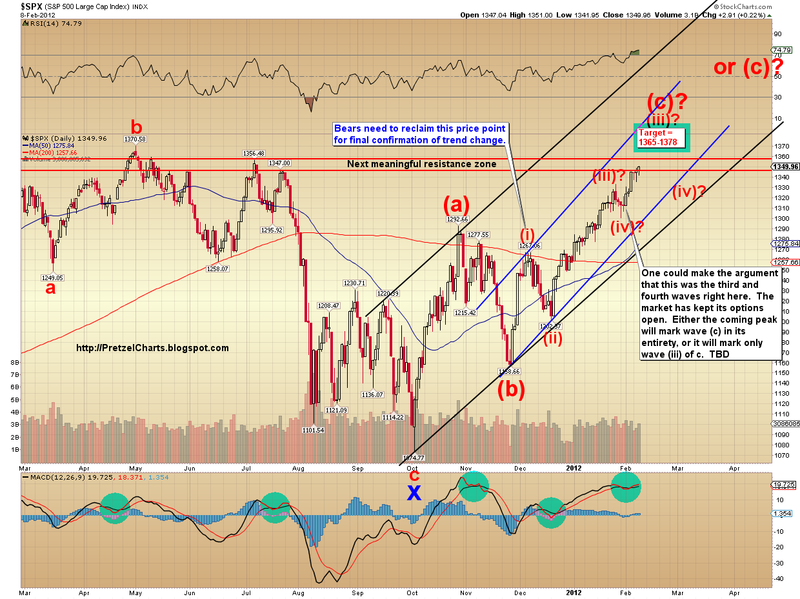 Mrkt is messing with ppl today, WWWCI gets bullish at tops and bearish at bottom of range. RUT futures... which way do we go? heres the Daily VIX Option trades.. There is a bearish flag and it's getting to the tip. Draw your trendlines, remember? will break out and finish strong. and gap up tomorrow. again. LOL! That was my very first thought. In fact, I texted a friend saying that Walt & Jessie must be working overtime on Season-5. Best TV program of all time IMO. $VIX up 1.27%, this is like two trains running on the same track, something gunna happen. Longs are not willing to sell, they are buying protections to ride the next leg up. Shorts are torn. Man, I'm not liking these mixed signals. The Aussie dollar is looking very toppy, the S&P is looking tired as hell on its 60 min. chart, but the 60 min. chart of the Russell look like a damned launch pad. And at the same time, the Russell's VIX seems about to issue a buy signal (buy the RVIX and sell the Russell). It' oh so aggravating at this point. Aussie D is nervous about China's inflation heating up (yesterday's data). S&P is dragged along, kicking and screaming, by tech. Cheap (read free) money is snapping up junks. I meant rising wedge. I have reason to think we will gap up on Monday to fake out the rising wedge. Then run down hard to 1345.
put a W%R on the 120, look at the divergence, divergence also appears in the stochs. this does not appear in the SPX or INDU tho. let us see what that says. so who do we believe? Like to short... go ahead now lol. For all the fine analysis on this site, I still conclude we are starting a new bull phase. Breadth is too good, more stocks are participating I'm the rally. There is less risk of European financial contagion. Finally money supply is increasing. All of this supports the bullish case, not to mention the tape. One thing I'm really torn about is whether or not bull market rules are in effect or bear market rules as pertains to the momentum indicators. Take the RSI for example... if we interpret this to be a bull market we would ignore overbought signals and buy on oversold signals. On the other hand, if we are truly in a new secular bear market, then we'll soon be shorting on the overbought signals and ignoring the oversold signals. We're at such an inflection point (or at least decision) that I honestly don't know which it is. Once that becomes clear, it should become easier to trade effectively. Not to mention that the 100% certain situation of Greece defaulting to the tune of 70% (if not more) is totally irrelevant. How wacky is that? add 2 green and 2 red and get 4 purple.. very pretty..
just checking in... making money on the long side, be back for targets when this thing tanks, which many not be for a few months.... greece is keeping everyone very optimistic! I'm not quite following. What are the implications of the premium on the out month decreasing? I appreciate that it causes the front month to increase, but how would you interpret it from the perspective of those who are writing the out month options? Wait... they're probably thinking it's getting too risky to be holding onto the short puts. Would that be right? Yup, they drop on good news that just wasn't good enough... as the old saying goes. I gotta tell ya though, this is a whole new definition of the term "wall of worry". I didn't realize I had my volume up a bit too high. I hit that link and jumped right outta my chair. short ES 50.25, intraday flash crash warning. . . The VIX will do that to ya.. like Batman.. POW! ZAAAP!! WHACCCKK!! Face it, those holding longs are nervous, so buying insurance, BUT this does not translate to selling. lol... BIFF! CRACK! MUNCH! WHAM! DONG! SMAACK! the non action today is very interesting. VIX up, TVIX up even more, market green, AAPL shooting for $500. One with bear glasses would read "the market is topping" One with bull glasses would read "we are consolidating for the next rally up." I think entering a trade in either direction at this level is crazy. And especially you are going to short from up here. The cup and handle on the intraday chart is too obvious, so maybe it's a fakeout move and the indexes will head lower from here.But what I see most principally is the perma-bid under the market that immediately recovered five points from 1,345 to 1,350 in the space of 20 minutes this morning. Then a pretty typical bleed off of a few points at 1,350 and another wrench back up to another new high. Buyers are completely in control of ALL of this. Including the short waterfall moves that are providing the symmetry and internal math that the market needs for it's professional participants to survive. Those moves downward are not sellers asserting themselves. They are necessary for the math of the market to work out. Going back to the start of the rally, it seems the bots are regularly triggering waterfall and FAST declines of seven to twelve points that are extremely brief in duration only after the 15 and 30 minute indicators have been maxed out (sometimes for quite awhile) and there has been at least eleven to seventeen points of travel to the upside that makes a new high by at least few points. 1. A new high that is at least three points above the previous one. 2. At least eleven points of travel from where the last move up started. 3. The 3, 5, 15 and 30 indicators on all charts have all maxed out. These are not my only guidelines for going short, but they're the minimum that I'll consider for any meaningful short position at the moment. We are currently only eight points higher from where this move started. And the new high is only one point higher. Though the indicators on the IT charts DID all peak and have now started to turn back down. By way of reference for recent SPX movements: The move on Tuesday started at 1,336 and finished yesterday at 1,351. A move of fifteen points upward. Which was followed by an eight point waterfall move down from there to 1,342 yesterday morning.The move back up yesterday from 1,342 ended around 1,353 today. A move up of eleven points. Then an eight point waterfall move down from there to 1,345 this morning.The market certainly is not going to remain this predictable. But it's a pattern to now be mindful of.If you scan the charts there are only a few exceptions to the above framework where the move higher was greater than twenty points and if it did happen, it was on an overnight move where it's your fault if you kept a short position open through that. But even intra-move on those there were enough meaningful retraces to let out the pro shorts who had the werewithal to average down their positions and get out. Just took the GMCR chips off the table - $7 for $0.7 bet. Not a bad deal for a week's work. Could have hang on till tomorrow's OpEx. ALBERTAROCKS , from your question from down below.. here is the video from JAN 24th. (i promise, last one for today, i am in Hawaii and heading out to the beach now :) but my bud Jamie Tyrrell from the vix pit can explain the CONTANGO from out month VIX premiums to current cash VIX. hope this helps. this day was the start of some heavy volume on VIX options. Calvin Head forming in the SPX 5 minute chart! Uh oh. Dow closed up 6.66?? That's not the next-door neighbor's number, that's the MOTB. They're one of the few brands in the business that can still exact a "brand tax." Apple moonies start lining up to pay full retail for the latest whatever on the mere breeze of a rumor. But their market share has been steadily eroding and at some point that will force a reevaluation of some business models, margins or no margins. Thank you. Have fun. It's been 32 years since I was on Waikiki beach... to the day. My Fidelity screen says only 72,492 IWM shares traded at 02:44. Maybe there was a volume data glitch at stockcharts -- the other volume spikes seem to coincide, though. I have no reason to suspect a volume glitch at StockCharts. These little spikes happen all the time, particularly when a source of "ignition" is required. My point was that today it failed to ignite anything like usually does. Is it possible that Fidelity might not be all that "faithful" with 'their' data? I'm not familiar with that system at all. we have to see if this just moves to opposite BB or if it is the start of something. I think the start of something.